A few items I have discovered in my frequent raids on health-food stores recently... and now can't live without. 100% yummy-licious. Though purists would probably have you understand that there really is no such thing as "white" chocolate. Because they take out the chocolate and it's just made with the cocoa butter (from what I understand). Here's the manufacturer's description, which is luscious and accurate enough to make me forgive the lousy tiny picture on their website: "We’ve invented an ice cream that won’t drip all over your shirt! Incredibly creamy white chocolate with delectable cocoa nibs." I tried to get into Coconut Water before Gavriel Zev was born, but it seemed distinctly unappetizing to me while I was pregnant. It's apparently quite good for you - the original sports beverage, all electrolyte-balanced and whatnot. According to WW2 legend, it was apparently even used as IV fluid (straight from the coconut into your veins) to hydrate wounded soldiers in the Pacific. Oh-kay! Anyway, this brand, Vita Coco, has a star-K hechsher and is quite yummy. It's sweet but not sweet, kind of filling the place where a soda beverage would go with a one-ingredient, natural-sourced drink. Shouldn't take the place of water, tea, and other zero-calorie beverages, but at 60 calories in a 330ml tetra pak, definitely the lesser of many evils. Oh, and if you find the tetra pak itself kind of evil... it's also available in a larger "Tetra-brick" size so you can pour off individual servings. It is also available in a range of flavours, none of which I have tried beyond Boring Basic Coconut. 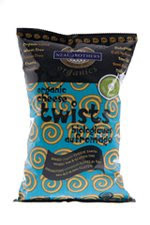 Finally, there's this pick from the "healthful Cheesies" department: Neal Brothers Organic Cheese Twists. The official website tagline is a little insipid: "A crunchy little twisty cheesy with a velvety cheese taste! Kids, of all ages, LOVE these healthier-than-your-average cheesy snack!" Anyway, I am always on the prowl for kosher cheese-flavoured anything, and these are fresh and somehow crispy and soft at the same time, so there you go. The hechsher is Kof-K.
And now, since I have mentioned the hechsher on the other two products, I would be amiss if I didn't go back and mention that the supervision on the Coco Camino bars is listed as a "Rabbi Abraham Hochwald" who is apparently the head of the Kosher Germany agency. The front page of the hechsher website also mentions he is no longer among the living (a fact not mentioned in his bibliography, also at the website). In any event, he looks reliable enough... zecher tzaddik livracha.